A 6-year-old-boy presented with hypoxia. 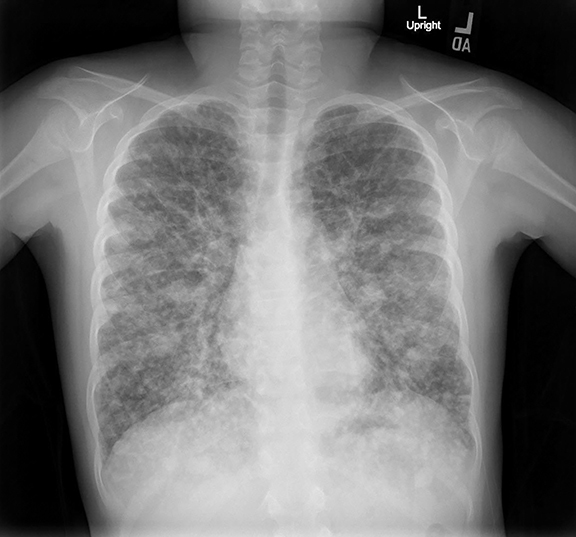 A chest radiograph (Figure 1) revealed innumerable small, non-calcified nodules throughout the chest with an approximately equal distribution between the upper and lower lobes. No osseous involvement was seen. 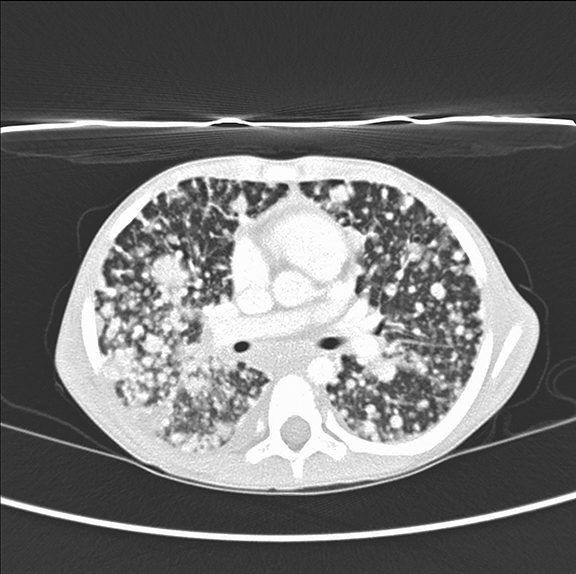 Unenhanced axial CT image of the chest in lung windows (Figure 2) shows numerous rounded noncalcified nodules of differing sizes scattered throughout both lobes. 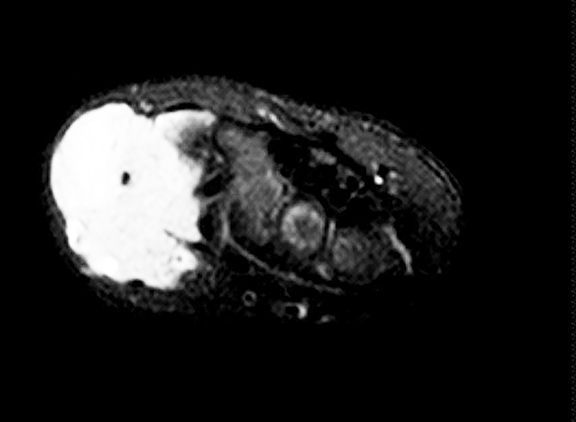 Axial MR images of the hand (Figure 3, T1, T2, T1 postcontrast) show a solid, soft tissue mass of the lateral aspect of the wrist with a homogeneous T2 bright and T1 dark appearance. The mass is homogeneously enhancing after administration of contrast. A homogeneous enhancement pattern is atypical, and a pattern of rim enhancement is most common. Congenital myofibromatosis with pulmonary manifestations. The differential diagnosis includes metastatic disease, fungal/TB infection, and vasculitis. Clinically, a myofibroma manifests as a solitary nodule in the dermis which can measure a few millimeters to a few centimeters. 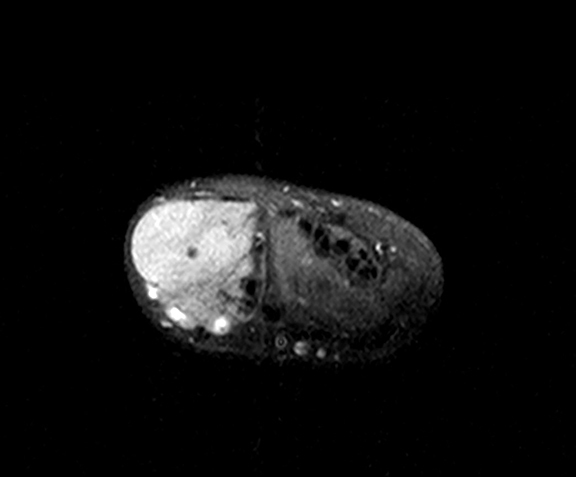 If the nodule is superficial it will be mobile while it will be nearly immovable if deeper tissues are involved. The solitary type has been found to be three times more common than multiple lesions. Solitary lesions are most common in the head and neck, followed by the trunk and then the extremities. It is very rare for a solitary lesion to involve the viscera; however, solitary lesions have been found in the bones, most commonly the maxillofacial bones. In patients with multiple lesions, up to 40% may be found in the viscera. The most common sites of visceral involvement are the lungs, heart, gastrointestinal tract, pancreas, and rarely the CNS. The visceral lesions are typically present at birth. Nodules grow the most in the perinatal period but can grow later in life. 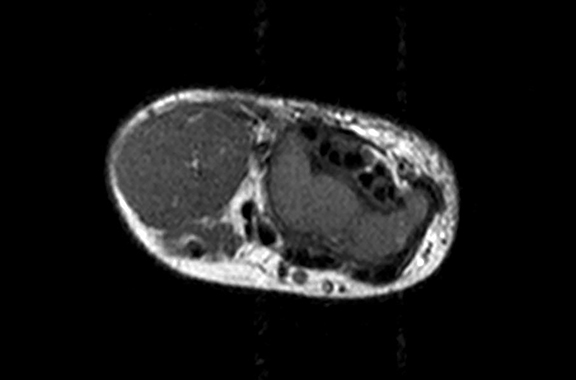 With the use of clinical, pathologic, and radiologic information congenital myofibromatosis can be diagnosed and the extent determined. The prognosis is highly dependent on the involvement of viscera which can be determined by ultrasound, CT, or MRI. In addition, accurate diagnosis should remove the need for further work up and unnecessary treatment in patients with extra-visceral disease. Arcangeli F, Calista D. Congenital myofibromatosis in two siblings. Eur J Dermatol .2006;16:181-183. Weiss S, Goldblum J. Enzinger and Weiss’s soft tissue tumors. 2008; 5th Edition. Elsevier, Philadelphia, PA.
Peterson M, Jorgensen SA, Towbin AJ, Towbin R. Congenital myofibromatosis with pulmonary manifestations. Appl Radiol. 2017;46(12):36-37. Prepared by Dr. Peterson, Dr. Jorgensen, and Dr. Richard Towbin while practicing in the Diagnostic and Interventional Radiology Department at Phoenix Children’s Hospital, Phoenix, AZ; and Dr. Alexander Towbin while practicing in the Radiology Department at Cincinnati Children’s Hospital, Cincinnati, OH.